Asus' T100 Transformer Book came out just over a year ago, offering a full Windows tablet experience that easily out-did failing Windows RT devices of the time. It has since been one of our favourite laptop / tablet hybrids to emerge, packing Intel's new breed of Z-series Atom processors. The newer and larger brother, the T200, keeps the things we liked about its fully-fledged Windows 8.1 predecessor, but packs a larger 11.6" screen and faster processor, throwing in some extra ports and a handy 2.5" drive bay into the keyboard dock, too. Just like Transformer devices that went before it, the T200 is a tablet / laptop hybrid, meaning you don't need to shell out for two separate gadgets. Whilst this may sound all well and good, it often means corners that are cut and compromises are made along the way. Fortunately, this isn't entirely true with the T200, as it can mostly claim to do both tasks quite admirably. At US$539 (around £349, or AU$690), there are few other hybrids that pack the same range of features. In fact, most other tablets at this price will eschew the keyboard dock, or not have the same transforming abilities. On first inspection it may look like a netbook, but Asus' Transformer Book T200 is a much more refined device than the mini laptops that were so popular just a few years ago. 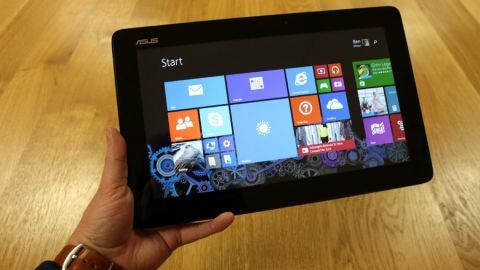 With the lid closed, the T200 could be mistaken for Asus' premium line of Zenbooks thanks to the similar concentric circular pattern, which makes the tablet feel considerably more tactile than if it were smooth plastic or metal. Whilst it may not pack quite the same power, or feature the same high-quality metals and polycarbonates as those pricey siblings, it's a laptop you won't mind taking along to a meeting or whipping out in public. Where buttons and ports are concerned, the T200 keeps the power button, volume and a dedicated Windows key easily accessible behind the top left edge of the tablet – just where you would expect. The tablet also features a micro-SD card reader for expandable storage and micro HDMI connector to give you video output options - should you require them. There's also a micro-USB connector which allows for full-sized USB host functionality via an optional cable. On the dock you'll find two full-sized USB ports - one of which is USB 3.0 certified. There's also an RJ45 LAN port - should you not have the facility to use the N-rated Wi-Fi - that features a unique design to keep it slimmer than if it featured a full-sized standard port. On the rear of the tablet, a thoroughly average 5MP camera is centred near the top of the tablet, whilst on the front there's a 2MP camera that is more than adequate for video calls, but fails miserably at anything else - particularly in low light. A speaker either side of the tablet give it stereo sound at a pretty loud volume, but their position means they can sometimes get obstructed by your own hands if using the tablet without the dock. The dock features a usable full-sized island keyboard that's very much the popular choice on laptops these days, whilst the touchpad is relatively expansive considering the overall size of the laptop - even if the buttons were little unresponsive at times. Flip the dock over and you're greeted with a nondescript matt plastic base, the only surprise being the additional storage hatch, which in the model I was testing housed a 500gb hard drive. You'll also notice that there isn't a noisy fan to distract you – only the almost inaudible purr of the hard drive. The T200 features an 11.6" touch-screen IPS display with a 1366 x 768 pixel resolution, which equates to an awfully underwhelming 135ppi. Whilst this resolution may have been sufficient in laptops and tablets a few short years ago, the lack of pixel density is more obvious than ever when put alongside full-HD alternatives like the Surface Pro 3. For using Windows 8.1 in the conventional fashion, the screen offers enough real estate to be perfectly usable, but when put alongside the ultra high-res screens of smaller tablets like the Nexus 9, the lack of resolution feels entirely disappointing. Of course, when you consider everything else that is packed in for the price, it's not particularly surprising. Being an IPS panel, colours are bright and viewing angles are excellent, but a reflective glass front makes it fairly difficult to use outside without the brightness ramped up to full. I found touchscreen input to be accurate, responsive and still genuinely useful for scrolling and quick navigation with the dock attached.